[Advertisement] A Real Automatic Boat Control/Trim Tab Control System that actually works - completely & automatically! 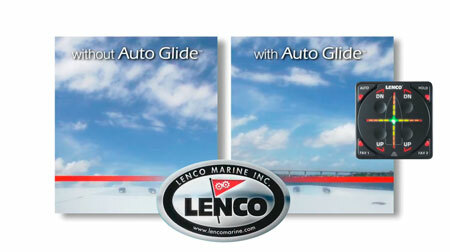 The Auto Glide system controls your trim tabs from the time you leave your dock until you come home again! The Auto Glide uses engine data and GPS data (depending on your installation method) to drive your boat to the most efficient running angle by adjusting your Lenco trim tabs as needed. This optimum running angle is determined during the set-up process after the installation of your Auto Glide system. - Automatically put your boat in the most efficient running angle. - Reduce the amount of bow rise of your boat during hole shot mode. - Eliminate bow porpoising (bow bounce). - Keep your boat level at all times. These actions will result in a smoother ride and the best possible fuel efficiency. Exclusively distributed by Sam Allen Wholesale.